This recipe is for an easy homemade thin crust pizza that can be ready to serve in an hour and a half — with a little warming help from a simple table lamp. It’s a delicious dough that really puffs up at the edges, but is actually a thin crust Neapolitan style. And it makes two crusts! I bake it in a very hot 500°F oven and the crust browns beautifully especially with the smidgen of sugar in the dough. This is very easy to make and the dome dough maker easily stretches out this very stretchy “windowpane” dough. 1. Place warm water in a bowl and add the yeast, sugar, salt and oil. The sugar is for browning the crust a little more and can be left out if preferred. 2. Stir the mixture well. 3. 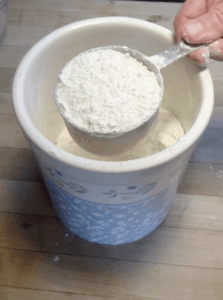 If you don’t have a scale, measure flour by scooping a measuring cup into the flour and shaking the cup until the flour is more or less level. This way, the dough won’t be too stiff and you can always add a little more flour if the dough is too moist. 4. Add the flour to the bowl and blend all the ingredients until evenly moist. 5. Knead with the dome for one minute, smearing the dough and turning the bowl and repeating. This will allow the dough to rise well and add dough strength. 6. Cover with plastic wrap. You can use a damp towel if you prefer, but plastic wrap makes a better seal, if you will be warming the dough with a lamp. 7. 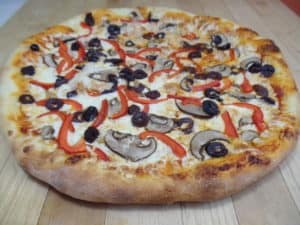 If you aim to be serving your pizza in about an hour and a half, you can speed proofing by placing your dough under or next to a table lamp with an incandescent bulb of 60 watts or more for about 45 minutes. 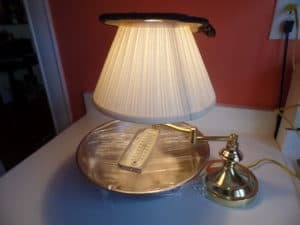 A gooseneck or overhanging lamp is best, but even placed next to a table lamp the dough temperature will rise and this will encourage the yeast to multiply more rapidly. Put a cover over the lampshade to keep the heat low. If you’re not in a hurry, you can let the dough double in size at room temperature, whatever it is. 8. Now stretch and fold the dough. Place the blade of the dome under a section of dough then stretch it out and over itself. This will make the dough strong and stretchy. 9. Let the dough proof another 30 minutes, using the lamp if your kitchen is cold. Prepare your toppings during this 30 minute time period. 10. Scrape the dough out of the bowl and place it on a floured surface. Give the dough a light coating of flour so it’s not so sticky. 11. Preheat the oven to 500°F. 12. Divide the dough in half to make two pizzas. Wrap in plastic or store in a plastic bag. You can freeze one for up to 3 months or refrigerate for up to three days. 13. Stretch the dough in your hands in a circular fashion, then place it onto a pizza pan or on a floured surface. 14. Place a little oil on the dome and gently press and stretch the dough out evenly. You can use your hands to stretch too. 15. Then add your toppings and bake on a lower rack for 12 minutes or so at 500°F. Subscribe to this blog for great baking tips and recipes.